Where is Cleo? Taken by child welfare workers in the 1970's and adopted in the U.S., the young Cree girl's family says she was stolen, raped and murdered while trying to hitchhike back home to Saskatchewan. Host Connie Walker joins their search. Christine travels to Pennsylvania for an emotional reunion with her brother, Johnny, who she hasn’t seen since she was a baby. Determined to get more answers about the days and weeks leading up to her sister’s death, Christine finally gets a copy of Cleo’s death certificate. That, and other documents begin to shed light on the truth she’s been seeking for decades. Download S2 Episode 1: Stolen. Murdered. Missing. 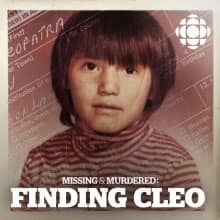 Download S1 Episode 0: Who Killed Alberta Williams?